This study was performed to clarify the relationship between fibrinolytic components and the pathology of allergy, particularly that during the development of nasal allergy and nasal tissue changes. Intranasal OVA challenge after sensitization by i.p. 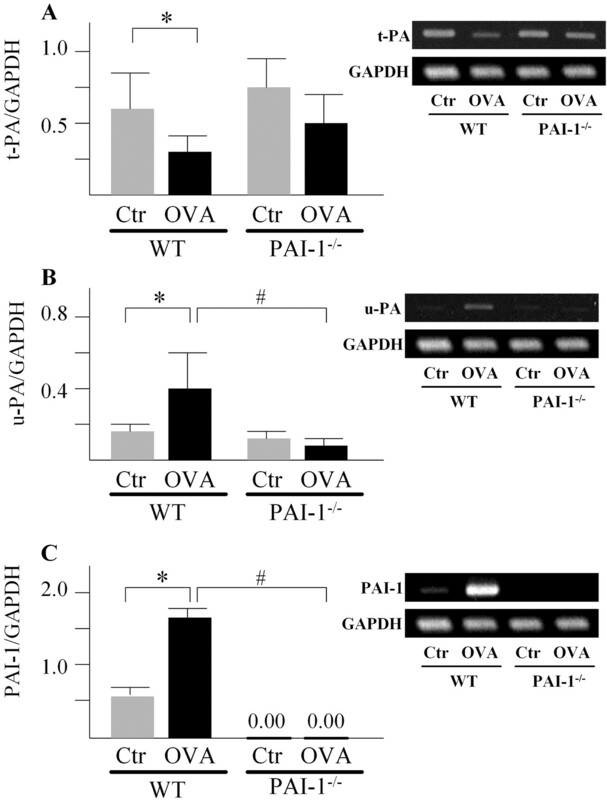 administration of OVA induced a higher level of excess subepithelial collagen deposition in wild-type (WT) C57BL/6J mice than in plasminogen activator inhibitor (PAI)-1-deficient (PAI-1−/−) mice. 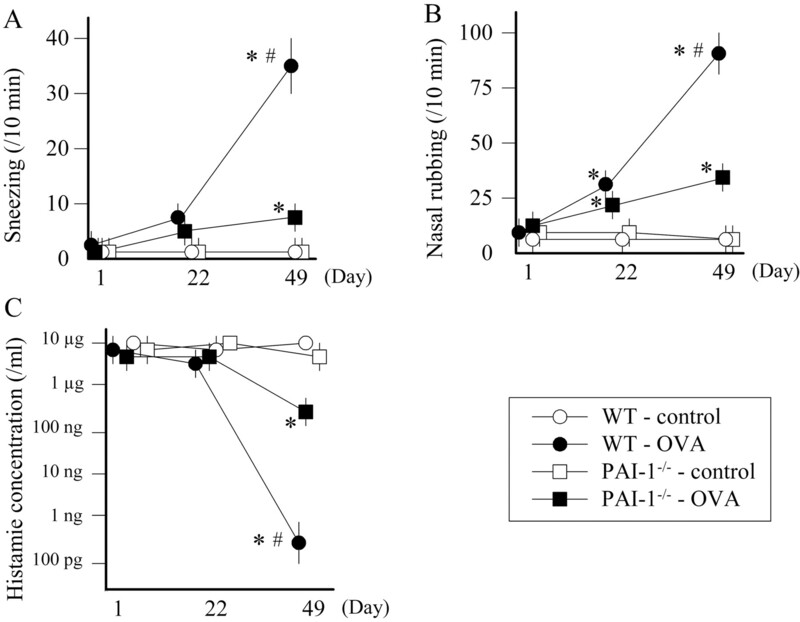 The excess PAI-1 induction in the nasal mucosa and higher level of active PAI-1 in the nasal lavage fluid of WT-OVA mice compared with those in WT-control mice suggested that the decrease of proteolytic activity inhibits the removal of subepithelial collagen. The frequency of sneezing, nasal rubbing, nasal hyperresponsiveness, production of specific IgG1 and IgE in the serum, and production of IL-4 and IL-5 in splenocyte culture supernatant increased significantly in WT-OVA mice. In PAI-1−/− mice, these reactions were absent, and specific IgG2a in serum and IFN-γ in splenocyte culture medium increased significantly. Histopathologically, there were marked goblet cell hyperplasia and eosinophil infiltration into the nasal mucosa in WT-OVA mice, but these were absent in PAI-1−/− mice. These results indicate that the immune response in WT-OVA mice can be classified as a dominant Th2 response, which would promote collagen deposition. In contrast, the Th2 response in PAI-1−/− mice was down-regulated, and the immune response shifted from Th2-dominant reaction to a Th1-dominant one. Taken together, these findings suggest that PAI-1 plays an important role not only in thrombolysis but also in immune response. Fibrinolytic components are associated with not only intravascular fibrinolysis, but also with various reactions in tissues, including ovulation, inflammation, neovascularization, tumor invasion, and tumor metastasis (1, 2, 3). Plasminogen activators (PA)3 and their inhibitors have important roles during initiation of the fibrinolytic cascade. Two types of PA are known, the tissue-type (t-PA) and the urokinase-type (u-PA) (4), and both are glycoproteins that convert the proenzyme plasminogen into the active enzyme plasmin. The PA inhibitors (PAI) are members of the serine protease inhibitor superfamily, and they inhibit PA (5). PAI-1 appears to be the predominant physiological inhibitor of t-PA and u-PA. In allergic diseases, tissue remodelings are observed. These changes are characterized by extracellular matrix (ECM) deposition, subepithelial fibrosis, and goblet cell hyperplasia in the airways (6, 7). It is thought that the fibrinolytic system is involved in ECM deposition and fibrosis in inflammatory tissues. Plasmin degrades fibrin and converts inactive pro-matrix metalloproteinase (MMP) into active MMP. Activated MMP degrades the ECM proteins including collagen, which is the main protein component of fibrotic tissue in the airway (8). Fibrinolytic components have been extracted from nasal polyps (9) and the maxillary mucosa of patients with sinusitis (10), and they have been observed immunologically in human nasal mucosa (11). In addition, we demonstrated previously that expression of u-PA and PAI-1 mRNAs in human nasal tissues with allergy were enhanced, in contrast to those in normal nasal tissues (12). It was shown that the 4G allele of the PAI-1 gene, which is associated with elevated plasma PAI-1 level, may contribute to the development of allergic disease in humans (13, 14). Oh et al. (15) reported that up-regulation of PAI-1 synthesis occurs in lung and bronchoalveolar lavage fluids in the OVA-challenged murine asthma model and that PAI-1 promotes ECM deposition in the airways and inhibits the activity of MMPs and plasmin generation. These reports suggested that fibrinolytic components, particularly PAI-1, contribute to the development of allergic disease and changes in the allergic tissue. To clarify the relationship between fibrinolytic components and the pathology of allergy, particularly in the development of nasal allergy and nasal tissue changes, we made a nasal allergy model with PAI-1−/− mice. In the present study, we used a murine model of allergic rhinitis induced by OVA. C57BL/6J PAI-1−/− and background-matched control mice PAI-1+/+ (wild type; WT) were generated anew by homologous recombination in embryonic stem cells, as described previously (16, 17). Animals were maintained at the Laboratory of Experimental Medicine (Jichi Medical School, Tochigi, Japan), according to the local guidelines for animal care. 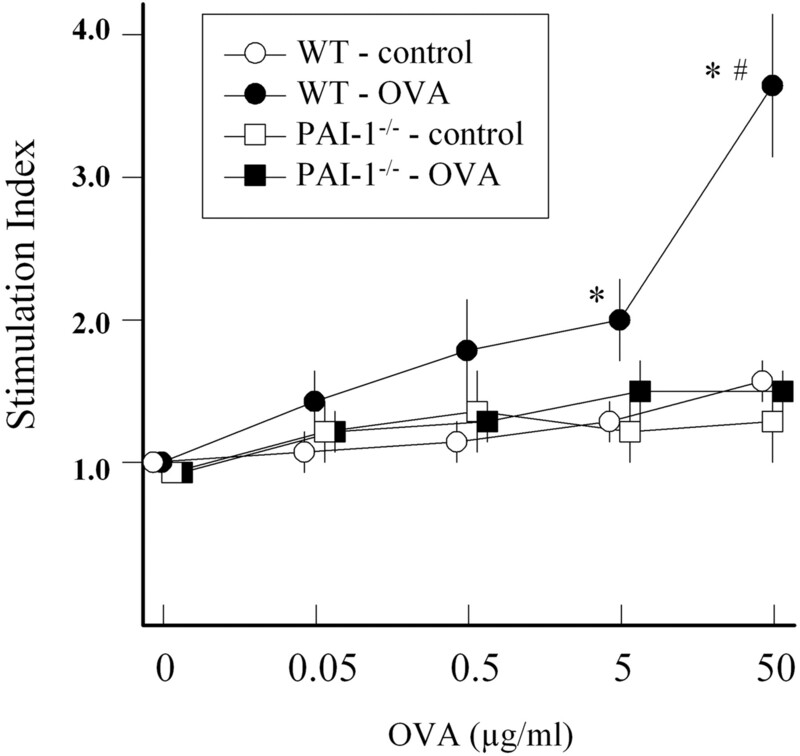 Age-matched (8-wk-old, female and male) PAI-1−/− and WT mice were placed in one of two groups: 1) OVA group, which was given OVA sensitization by i.p. injection and then received OVA by intranasal (i.n.) challenge five times a week for 4 wk (PAI-1−/− and WT mice; n = 10 each); and 2) control group, which was given normal saline instead of OVA in the same schedule (PAI-1−/− and WT mice; n = 10 each). Under pathogen-free conditions, mice in the OVA group were sensitized using OVA as follows: 10 μg/mouse OVA (Sigma-Aldrich) diluted by sterile normal saline with 1 mg/mouse aluminum hydroxide (Sigma-Aldrich) were administered to unanesthetized mice four times by i.p. injection on days 1, 7, 14, and 21, based on the protocol of Saito et al. (18). This was followed by i.n. challenge with OVA diluted by sterile normal saline (20 μl of 25 mg/ml OVA per mouse), administered five times a week for 4 wk (Fig. 1⇓). Protocol for OVA sensitization and i.n. challenge. Mice in the OVA groups were sensitized using OVA by i.p. injection on days 1, 7, 14, and 21. This was followed by administering nasal drops containing OVA, five times a week for 4 wk. Mice in the control groups were treated with diluent both during i.p. sensitization and i.n. challenge instead of OVA. Blood samples were collected on days 1, 8, 15, 22, 36, and 49. Nasal symptoms were evaluated by symptom observation (sneezing and nasal rubbing) on days 1, 22, and 49. Nasal responsiveness was also measured by i.n. provocation of histamine on days 1, 22, and 49. Nasal symptoms were evaluated by counting the number of sneezes and itching motions (nasal rubbing) for 10 min after OVA i.n. provocation for the OVA group or saline i.n. provocation for the control group at the time points of days 1, 22, and 49. Nasal responsiveness was also measured by i.n. provocation of histamine as described previously (18). After nasal challenges with 10 μl of serially diluted histamine solutions, sneezes and nasal rubbing were counted, and the time point was noted at which these were significantly higher than those associated with the normal saline control. This was expressed as the limiting concentration of histamine and measured on days 1, 22, and 49. At 24 h after the last i.n. provocation with OVA or saline, the mice in each group were anesthetized by i.p. injection of sodium pentobarbital (Somnopentyl; 25 mg/kg; Schering-Plough), and their four limbs were attached tightly to the cork board in a supine position with the neck hyperextended. After tracheotomy was performed in each mouse, a polyethylene catheter (inside diameter, 1.05 mm) connected to a syringe was antidromically inserted intratracheally into the choana. A 1-ml aliquot of PBS at 37°C was injected slowly into each of the nasal cavities, and the perfusate that came out of the anterior nares was collected. In this way, on average, 0.8 ml of NLF was obtained. The NLF was centrifuged (4000 × g, 10 min), and the supernatant was stored at −80°C until analysis. After NLF collection, the spleen was aseptically removed from the animal. Subsequently, the mice were killed by exsanguination, and the nasal mucosa of five mice from each group were removed carefully. The nasal mucosa was cut to <5-mm thickness and placed in 10 vol of RNAlater reagent (RNA stabilization reagent; Qiagen) for subsequent RNA isolation. For the five remaining mice of each group, perfusion fixation by 4% paraformaldehyde was performed after sacrifice. After fixation, each mouse was decapitated, and then the specimens were decalcified in 10% EDTA for 7 days. The fixed specimens were embedded in paraffin and cut into 5-μm-thick sections. The nasal cavity was sectioned transversely at the level of the maxillary sinus. Goblet cells were quantified by the periodic acid-Schiff (PAS) reaction (19, 20). The degree of goblet cell hyperplasia was assessed by calculating the percentage of the PAS-stained area to the total resorptive epithelium area of the nasal septum. The eosinophils that infiltrated the nasal septum mucosa were counted in Luna-stained sections as described previously (21). Additionally, the neutrophils that infiltrated nasal septum mucosa were counted in May-Giemsa-stained sections. For immunohistochemical staining, specimens embedded in paraffin were cut into 5-μm-thick sections and floated onto aminoalkylsilane-coated slides (Polysciences). The sections were deparaffinized and rehydrated. After microwave treatment, the sections were treated with 0.3% hydrogen peroxide in methanol for 15 min to inhibit the endogenous peroxidase activity of blood cells and then treated with 1% BSA in PBS (pH 7.4) containing blocking reagent for another 10 min at 25°C. An appropriate nonimmunized serum, either 1% nonimmunized rabbit serum (DakoCytomation) or 5% nonimmunized swine serum (DakoCytomation), was used as the blocking reagent. Goat polyclonal Abs against murine t-PA (Santa Cruz Biotechnology) and u-PA (Santa Cruz Biotechnology) and rabbit polyclonal Ab against murine PAI-1 (Molecular Innovations) were used for the primary Abs. For the purpose of examining subepithelial fibrosis, goat polyclonal Ab against murine collagen type I (Santa Cruz Biotechnology) and rabbit polyclonal Ab against murine collagen type III (LSL Company) were used for the primary Abs. The treated sections were incubated with the primary Abs at the appropriate concentrations (1 μg/ml anti-t-PA, 2 μg/ml anti-u-PA, 1 μg/ml anti-PAI-1, 2 μg/ml anti-collagen type I, or 1 μg/ml anti-collagen type III) in PBS with 1% BSA for 10 h at 4°C. Rabbit Ab against goat IgG labeled with HRP (DakoCytomation) and swine Ab against rabbit IgG labeled with HRP (DakoCytomation) were used for the secondary Abs. Each sample was washed extensively with PBS containing Triton X-100 and then incubated with the secondary Abs at the appropriate concentrations (2 μg/ml anti-goat IgG or 1 μg/ml anti-rabbit IgG Abs) in PBS with 1% BSA for 1 h at 24°C. After washing again, immunoreactive sites were visualized with hydrogen peroxide and diaminobenzidine and then counterstained with hematoxylin. Control sections were incubated with 5 μg/ml nonimmune rabbit IgG (DakoCytomation) or 5 μg/ml nonimmune goat IgG (DakoCytomation) instead of the primary Abs, respectively. To evaluate the production of fibrinolytic components (t-PA, u-PA, and PAI-1) in nasal mucosa, we examined the presence of mRNA of mouse t-PA, u-PA, and PAI-1 by real-time RT-PCR. The nasal tissues for RNA isolation (20–30 μg) were homogenized, and total RNA was isolated by using the RNeasy Mini kit (Qiagen) as described previously (12, 22, 23). Total RNA (0.5 μg) from each sample was reverse transcribed as described previously (12). Real-time quantitative PCR was performed using a TaqMan Gold RT-PCR kit (PerkinElmer Applied Biosystems) and an ABI Prism 7700 Sequence Detection System (PerkinElmer Applied Biosystems) (12, 24). Amplified PCR products were resolved in 2% agarose gels, stained with ethidium bromide, and photographed under UV light. The reverse transcriptase enzyme was omitted from the cDNA synthesis for each specimen to serve as a negative control. The respective primers and probes for t-PA (25), u-PA (26), PAI-1 (27), and GAPDH (28) used in this study were chosen with the assistance of the computer program Primer Express (PerkinElmer Applied Biosystems). We conducted BLASTN searches to confirm the total gene specificity of the nucleotide sequences chosen for the primers and probes and the absence of DNA polymorphisms. Primers were purchased from Invitrogen Life Technologies, and the probes were purchased from PerkinElmer Applied Biosystems. These sequences are listed in Table I⇓. According to the manufacturer’s instructions, NLF were assayed for PAI-1 total protein by a sandwich ELISA kit (Molecular Innovations) and analyzed for active PAI-1 by a PAI-1 activity assay kit (Molecular Innovations). The lower limit of detection for both assays was 0.05 ng/ml. OVA-specific IgG1, IgG2a, and IgE levels were measured by ELISA. Blood samples were collected from the tail at the time points of days 1, 8, 15, 22, 36, and 49. The 96-well polystyrene microtiter plates (Nunc) were coated with OVA (5 μg/ml) in PBS (pH 7.2) for 24 h at 4°C. Nonspecific sites were blocked with PBS containing 20% skim milk (Difco Laboratories). Serum samples diluted in the blocking buffer (1/800 for IgG1, 1/300 for IgG2a, and 1/10 for IgE Abs) were incubated for 2 h at 24°C. Subsequently, for IgG1 and IgG2a, stock solutions of rabbit anti-mouse IgG1 and IgG2a Abs (Bio-Rad Laboratories) were added, respectively, and incubated for 2 h at 24°C. Bound Ig were detected using either peroxidase-conjugated goat anti-rabbit IgG Ab (2 μg/ml) (BioSource International) or goat anti-mouse IgE Ab (1 μg/ml) (Bethyl Laboratories) and ABTS/H2O2 (Kirkegaard & Perry Laboratories) as substrate. OD405 were measured. Total IgE Abs were measured by a sandwich ELISA using the mouse IgE ELISA quantitation kit (Bethyl Laboratories) according to the manufacturer’s instructions. The enzymatic activity was measured using ABTS/H2O2 (Kirkegaard & Perry Laboratories) as substrate. OD405 was measured, and IgE concentrations were determined by interpolation from a standard curve performed with purified mouse IgE. Preparation of splenocytes and proliferation assay were performed as described previously (29). In brief, the spleen was removed from the animal and then minced and forced through a mesh. After erythrocytes were lysed, the cells were washed and resuspended in the medium, RPMI 1640 (Invitrogen Life Technologies), containing 10% FBS, 20 μg/ml penicillin, and 20 μg/ml streptomycin. Spleen cells (106/ml, 0.1 ml/well) were plated into 96-well plates and stimulated with PHA (50 μg/ml) and OVA (500, 50, 5, and 0.5 μg/ml) for 72 h. As the control, cells were incubated with only the medium. Thereafter, cultures were pulsed with 1 μCi/well [3H]thymidine (Amersham Biosciences) for 16 h. Cells were harvested, and their [3H]thymidine uptake was measured by scintillation counting. Proliferative responses were calculated as the means of triplicate wells and were expressed as the stimulation index (SI). A SI of >2 was considered positive. Spleen cells (106/ml, 1 ml/well) were plated in 24-well plates and stimulated with 50 μg/ml OVA. After 48 h, supernatants were taken and stored at −80°C until analysis. The levels of IL-4, IL-5, and IFN-γ in the supernatants and NLF were measured by sandwich ELISA using the mouse IL-4, IL-5, and IFN-γ ELISA Biotrack system kit (Amersham Biosciences) according to the manufacturer’s instructions. Results were compared using one-way ANOVA for nasal symptoms, nasal histamine responsiveness, Ab levels, and proliferation assays. Except for these experiments, unpaired Student’s t test was used to compare data between observations in PAI-1−/− and WT mice. Differences were considered significant for p values <0.01. Nasal symptoms, sneezing and nasal rubbing, were observed for 10 min after i.n. challenge at the time points of days 1, 22, and 49. As shown in Fig. 2⇓, A and B, nasal symptoms were accelerated significantly in the WT-OVA group. The frequency of sneezes and nasal rubs were 4-fold less in the PAI-1−/−-OVA group than in the WT-OVA group on day 49. 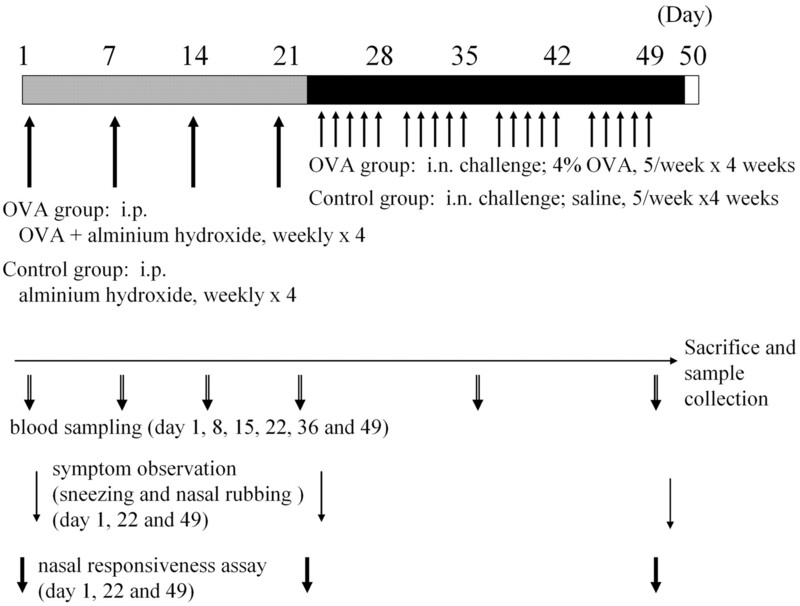 The dose of histamine inducing nasal hyperresponsiveness in the PAI-1−/−-OVA group was at least 1000-fold lower than that in the WT-OVA group after OVA challenge (Fig. 2⇓C). Nasal symptoms and nasal histamine responsiveness in WT and PAI-1−/− mice. Nasal symptoms were evaluated by counting the number of sneezes (A) and itching motions (B) for 10 min after OVA i.n. provocation for each group on days 1, 22, and 49. Nasal histamine responsiveness (C) was expressed as the minimum concentration of histamine that caused both sneezing and nasal rubbing on days 1, 22, and 49. Values are means ± SEM of 10 samples in each group. ∗, p < 0.01 when compared with each control group at the same day point. #, p < 0.01 when compared with PAI-1−/−-OVA group at the same day point. 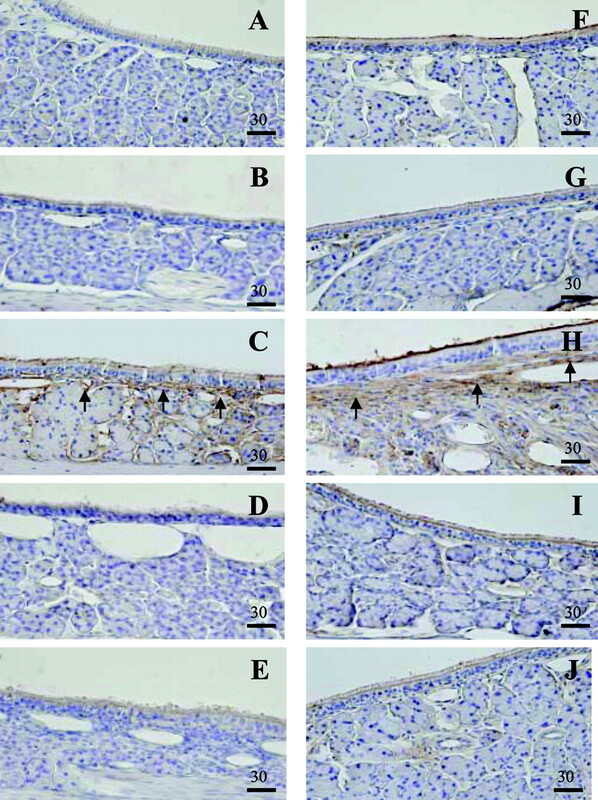 Immunohistochemistry for collagen types I and III in the WT-OVA group showed strong immunoreactivity in the subepithelial region (Fig. 3⇓, C and H). Additionally, numerous collagen bundles were observed clearly throughout the interstitial submucosal tissue. In the sections from the other groups of mice, the submucosal tissue only showed weak immunoreactivities for collagen types I and III (Fig. 3⇓, B, D, E, G, I, and J). Immunohistochemical staining of collagen types I and III in mouse nasal mucosa. Control sections treated with nonimmune goat IgG (A) or nonimmune rabbit IgG (F) were devoid of stain. Sections were immunostained with anti-collagen type I (B–E) and anti-collagen type III (G–J), respectively. Figures show the nasal mucosa of WT control (B and G), WT OVA (C and H), PAI-1−/− control (D and I), and PAI-1−/− OVA (E and J). Arrows indicate positive staining. Bars, 30 μm. As shown in Fig. 4⇓A, t-PA mRNA expression significantly decreased in the WT-OVA group compared with that in the WT-control group. However, there was no significant difference in t-PA mRNA expression between the PAI-1−/−-OVA group and PAI-1−/−-control group. Interestingly, the level of u-PA mRNA was higher in the WT-OVA group than the WT-control group. Even more notably, in the PAI-1−/− mice, the u-PA level of the OVA sensitization group did not increase, being significantly lower than that in the WT-OVA group (Fig. 4⇓B). PAI-1 mRNA expression significantly increased in the WT-OVA group compared with that in the WT-control group (Fig. 4⇓C). Fibrinolytic components mRNA expression in mouse nasal mucosa. Quantitative real-time RT-PCR was performed for t-PA (A), u-PA (B), and PAI-1 (C) mRNA in each group. In addition, representative electrophoretic patterns of PCR products are shown. Values are means ± SEM of five samples for each group. Ctr, Control. ∗, p < 0.01 when compared with each control group. #, p < 0.01 when compared with the PAI-1−/−-OVA group. 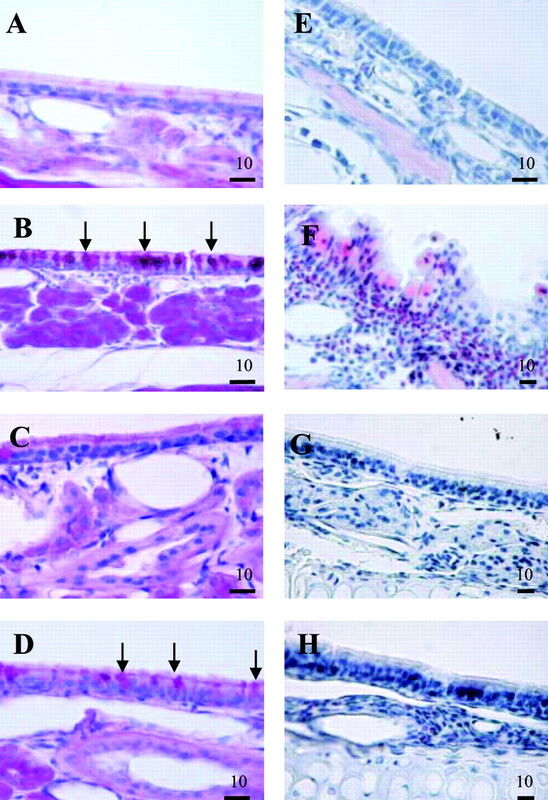 In murine nasal mucosa, t-PA-immunoreactive material was localized predominantly in the epithelium (Fig. 5⇓, B–E). t-PA staining in the epithelium of the WT-OVA mice was weaker than that of the WT-control mice (Fig. 5⇓, B and C). In contrast, the PAI-1 signal in the submucosal gland of the WT-OVA group was much stronger than that in the WT-control mice (Fig. 5⇓, L and M). In addition, positive staining of u-PA was noted exclusively in the epithelium and the submucosal glands in the WT-OVA group (Fig. 5⇓, G–J). These histological data on the fibrinolytic components in the WT-OVA group was almost the same as what was observed in the nasal mucosa of human allergic patients (12). Surprisingly, the u-PA signal was very weak in PAI-1−/− mice (Fig. 5⇓, I and J). Immunohistochemical staining of fibrinolytic components in mouse nasal mucosa. Control sections treated with nonimmune goat IgG (A and F) or nonimmune rabbit IgG (K) were devoid of stain. Sections were immunostained with anti-t-PA (B–E), anti-u-PA (G–J), and anti-PAI-1 (L–O), respectively. Figures show the nasal mucosa of WT-control (B, G, and L), WT-OVA (C, H, and M), PAI-1−/−-control (D, I, and N), and PAI-1−/−-OVA (E, J, and O). Arrows indicate positive staining. Bars, 10 μm. To examine PAI-1 production and activity in OVA-challenged murine nose, PAI-1 ELISA and PAI-1 activity assay were performed. The level of PAI-1 total protein in the NLF from the WT-OVA group was 5-fold higher than that from the WT-control group (Fig. 6⇓A). The active PAI-1 in the NLF from the WT-OVA group was 5-fold greater than that from the WT-control group (Fig. 6⇓B). No active PAI-1 and PAI-1 total protein were detected in the NLF from PAI-1−/− mice after challenge with OVA or saline. PAI-1 level and activity in NLF. NLF were assayed for PAI-1 total protein by sandwich ELISA (A), and for active PAI-1 by PAI-1 activity assay (B). Values are means ± SEM of five samples for each group. Ctr, Control. ∗, p < 0.01 when compared with each control group. #, p < 0.01 when compared with the PAI-1−/−-OVA group. The WT-OVA group developed high levels of specific IgG1 and IgE Abs in sera (Fig. 7⇓, A and C), and little or no OVA-specific IgG2a production was observed (B). In the PAI-1−/−-OVA group, the levels of specific IgG1 and IgE Abs in sera, although higher than those of the control group, were far less than those in the WT-OVA group. In contrast, only the PAI-1−/−-OVA group had a high serum level of specific IgG2a Ab. The increase of OVA-specific IgE levels was parallel to that in total IgE concentration in mouse sera (Fig. 7⇓D). Time course and levels of OVA-specific IgG1, IgG2a, and IgE, and total IgE in sera of mice. A, Specific IgG1; B, specific IgG2a; C, specific IgE; and D, total IgE. Values are means ± SEM of 10 samples in each group. ∗, p < 0.01 when compared with each control group at the same day point. #, p < 0.01 when compared with the PAI-1−/−-OVA group (A, C, and D) or when compared with the WT-OVA group (B) at the same day point. To determine whether cytokines were present in the nasal cavity during development of allergy to OVA, we collected NLF from mice in each group and measured the levels of IL-4, IL-5, and IFN-γ. The levels of IL-4 and IL-5 in the NLF from the WT-OVA group were significantly higher than those from the PAI-1−/−-OVA group. Conversely, the NLF from the PAI-1−/−-OVA group contained a higher level of IFN-γ than those from the WT-OVA group (Table II⇓). To determine the systemic lymphocyte cytokine secretion profiles, supernatants from cultured lymphocytes stimulated with OVA were harvested and assayed for IL-4, IL-5, and IFN-γ. The lymphocytes from the WT-OVA group produced significantly higher levels of IL-4 and IL-5 compared with those from the PAI-1−/−-OVA group. Conversely, OVA-stimulated cells from the PAI-1−/−-OVA group had a significantly higher level of IFN-γ than those from the WT-OVA group (Table II⇓). To evaluate the role of T cells in the development of allergy to OVA, we determined the lymphoproliferative response from splenocytes after in vitro stimulations. Spleen cells from mice in the WT-OVA group showed a significant dose-dependent proliferative response to OVA stimulation (Fig. 8⇓). In particular, when the OVA concentration was >5 μg/ml, the SI in the WT-OVA group was >2 and significantly increased in comparison with that in the WT-control group (p < 0.05). In other groups, including PAI-1−/− mice, the SI did not exceed 2 at any concentration. Proliferation of splenocytes following stimulation with OVA. Splenocytes were cultured in triplicate at 1 × 106 cells/ml. Results are expressed as the SI. Values are means ± SEM of 10 samples in each group. ∗, p < 0.01 when compared with the WT-control group at the same OVA concentration. #, p < 0.01 when compared with the PAI-1−/−-OVA group at the same OVA concentration. We examined goblet cell hyperplasia and eosinophilic infiltration in nasal mucosa to judge whether allergic inflammation occurred in the nasal cavity of mice (Fig. 9⇓). The examination of PAS-stained sections revealed that the Ag challenge in the WT-OVA group induced a marked goblet cell hyperplasia in the resorptive epithelium of the nasal cavity (Fig. 9⇓, A and B). Hyperplasia in the WT-OVA group was more outstanding than that in the PAI-1−/−-OVA group (Fig. 9⇓, C and D). The number of eosinophils infiltrating the nasal septum mucosa was 30-fold less in the PAI-1−/−-OVA group than in the WT-OVA group (Fig. 9⇓, E–H). In contrast, only a few neutrophils infiltrated the nasal septum mucosa, and there was no significant difference between each group in the number. The quantification data of goblet cell hyperplasia and cellular infiltration are shown in Table III⇓. Pathological changes in mouse nasal mucosa. The sections were stained with the PAS histochemical reaction in the WT-control (A), WT-OVA (B), PAI-1−/−-control (C), and PAI-1−/−-OVA (D) groups, respectively. Luna staining was performed in nasal mucosa for the WT-control (E), WT-OVA (F), PAI-1−/−-control (G), and PAI-1−/−-OVA (H) groups, respectively. A–D, Arrowheads indicate mucus in goblet cells of the epithelium and mucinous cells of the submucosal gland (PAS positive). Bars, 10 μm. The PA-plasmin system plays an important role in inflammation as well as intravascular fibrinolysis. Inflammation in diseases such as allergy consists of various phases, cellular infiltration, fibrosis, edema, and tissue remodeling. Although the effects of fibrinolytic components in allergy are still obscure, we can assume that these components may be significant factors in each phase of allergy, because previous studies have shown the involvement of the PA-plasmin system in each phenomenon of inflammation (2, 12, 30). In this study, we demonstrated that WT mice can develop nasal allergy for OVA, but the PAI-1− mice cannot. The clinical symptoms of allergy in our system were defined to be sneezing and nasal rubbing. As shown in Fig. 2⇑, local administration of OVA induced allergic symptoms in sensitized mice. Previous studies have shown subepithelial depositions of collagen types I and III in bronchial biopsy specimens of asthma patients and allergic nasal mucosa that correlate with airway hyperresponsiveness (31, 32). As shown in Fig. 3⇑, excess amounts of brown-stained type I and type III collagen are found in the nasal mucosa obtained from OVA-challenged WT mice in our system. In contrast, the collagen deposition in the nasal mucosa from OVA-challenged PAI-1−/− mice appeared less significant than that in the OVA-challenged WT mice. Interestingly, in this mouse model, at the local sensitization termination point (day 49), nasal sensitivity not only to histamine but also to OVA correlates with the accumulation of collagen (Fig. 2⇑). Using WT and PAI-1−/− mice, Hattori et al. (33) in the bleomycin-induced pulmonary fibrosis model and Oh et al. (15) in the OVA-induced asthma model observed the similar effect of PAI-1 on excess fibrous material accumulation in mouse lung tissues. PAI-1 is the primary physiological inhibitor of both u-PA and t-PA. PA converts the inactive proenzyme plasminogen to plasmin, a protease of fairly broad substrate specificity, and then plasmin and metalloprotease activated by plasmin are supposed to play a central role in the concerted immune response of the cell to degrade matrix proteins and cross tissue planes (15). We thus examined the effect of PAI-1 deficiency on the production of PA in mouse nasal mucosa. As shown in Fig. 4⇑, u-PA and PAI-1 mRNA levels of the WT-OVA group were significantly higher than those of the control mice group. However, the t-PA mRNA was significantly down-regulated. In contrast, the t-PA mRNA level in PAI-1−/− mice was not significantly different between the OVA-sensitized group and the nonsensitized control group. The u-PA mRNA level of PAI-1−/−-OVA mice was significantly lower than that of WT-OVA mice. The PAI-1−/− mice definitely had a lower level of u-PA mRNA, because this was also confirmed by the immunostaining study on the nasal mucosa (Fig. 5⇑). However, the net PA activity in PAI-1−/− mice should not be lower than that in WT mice, because there was almost no inhibitor of u-PA in PAI-1−/− mice, and PAI-1 mRNA and protein were significantly increased in WT-OVA mice. 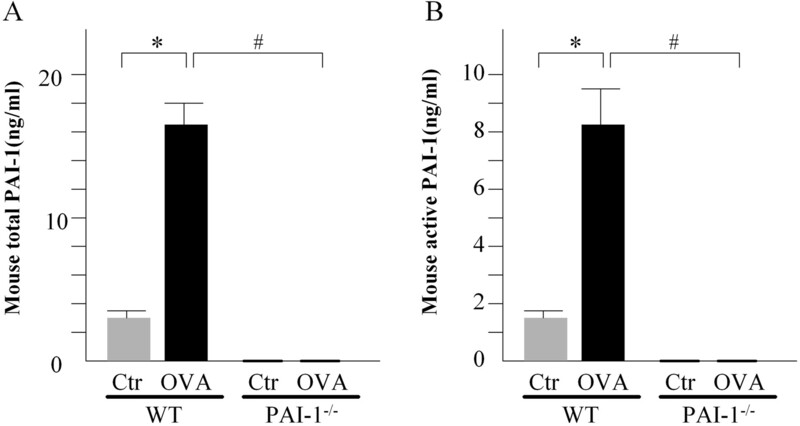 In addition, in WT-OVA mice, active PAI-1 levels, meaning the residual antiproteolytic activity of PAI-1 after interaction with PA, were also higher than those in the saline-challenged mice (Fig. 6⇑B). In the nasal septum, there was a small number of mast cells, which were suggested as PAI-1 source in asthma (34), and neutrophils; we could not find any significant difference in the number of these cells among the WT-OVA mice and other genotypes of mice (Table III⇑). Although many cytokines, released from white blood cells, would be involved in the up-regulation of the PAI-1 production, the main source of PAI-1 may be the nasal submucosal gland, as shown in Fig. 5⇑M. Taken together, these observations would suggest that inhibition of proteolytic activity by abnormal induction of PAI-1 decreases the MMP activation and collagen removal in allergic rhinitis. In this scenario, however, PAI-1 plays rather a secondary role. Is there another possible mechanism in which PAI-1 may have a major role in promoting collagen deposition? In type I allergy, including allergic rhinitis, increased serum IgE is characteristic of the immune reaction after exposure to an Ag. In mice, the Th2 response results in IgG1 and IgE production, whereas the Th1 response leads to IgG2a synthesis (35). Allergic rhinitis is hence considered to be a result of Th2 cell activation. The significantly increased productions of IgE and IgG1 and the low levels of IgG2a in WT-OVA mice immunized and challenged with OVA (Fig. 7⇑, A–C) implicated the Th2 response against this allergen. 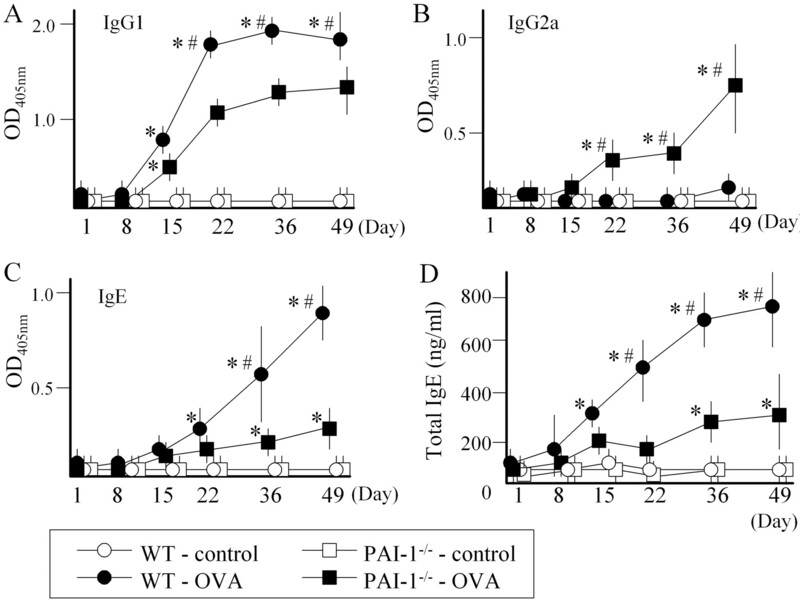 In contrast, high levels of specific IgG1 and IgE were nearly absent in PAI-1−/−-OVA mice. Conversely, only the PAI-1−/−-OVA group showed a significant increase in the level of specific IgG2a. Thus, these results indicate that down-regulation of the Th2 immune response in PAI-1−/− mice brings about an inappropriate overactivation of the Th1 immune response to the Ag, which would otherwise induce the Th2 response instead. Considering the importance of the Th2 phenotype for development of fibrotic pulmonary and extrapulmonary complications (36), it is possible that the Th2 phenotype itself would promote collagen deposition in the WT compared with PAI-1−/− mice. The change of immune responsiveness in PAI-1−/− mice was also confirmed in the cytokine profiles of the NLF (local) and the supernatant of the cultured lymphocytes of the spleen (systemic) from mice challenged by OVA. The levels of IL-4 and IL-5 in the supernatant of OVA-stimulated lymphocyte cultures from WT-OVA mice were 10–20 times higher than those from PAI-1−/−-OVA mice. OVA-stimulated cells from PAI-1−/−-OVA mice had a 100-fold higher level of IFN-γ than those from WT-OVA mice. The tendencies of these cytokine profiles were also reflected in the splenocyte proliferation assay from the conditioned mice (Fig. 8⇑). These results show that the sensitized group exhibited each immune reaction not only locally but also systemically, explaining the high level of IgE in the WT-OVA mice. The high level of IL-4 would induce high-level Ab production, including IgE as described previously (37, 38), in the nasal cavity, thereby contributing to the immediate-type allergic reaction after Ag inhalation. In contrast, IL-5 has highly specific effects on eosinophilic proliferation, migration, activation, and survival (39, 40). The high level of IL-5 would be responsible for the infiltration of eosinophils into the nasal mucosa (Fig. 9⇑F). 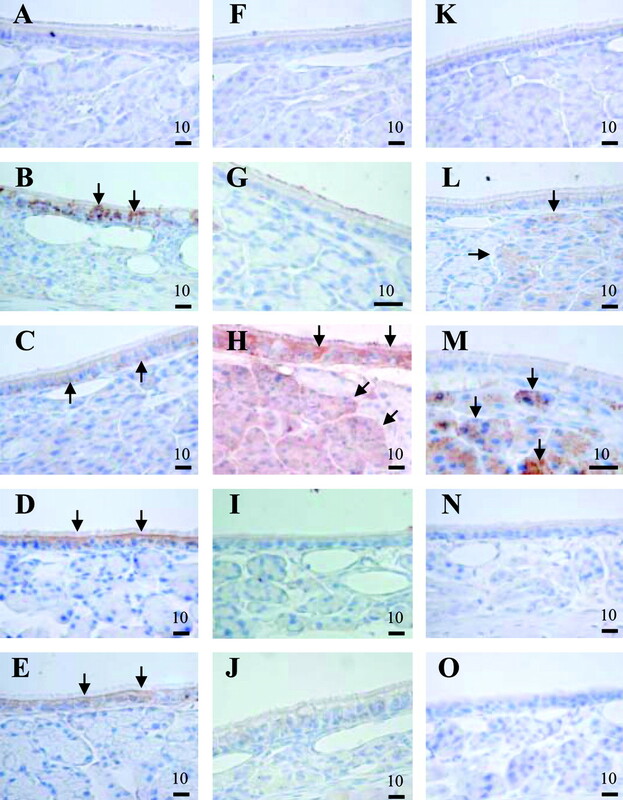 As for the hyperplasia of goblet cells in sensitized mice (Fig. 9⇑B), a similar tissue change is observed in human allergic rhinitis (12). Surprisingly, in PAI-1−/−-OVA mice, however, there was almost none of these mucosal changes (Fig. 9⇑, D and H). These histological data and cytokine profiles indicated that mice deficient in PAI-1 fail to generate the Th2 immune response to OVA challenge. Gyetko et al. (41, 42) have reported that u-PA is required to generate both the Th1 and Th2 immune responses to infection. Does this mean that down-regulation of the Th2 immune response in PAI-1−/− mice was induced through a low level of u-PA? This seems unlikely, because although the PAI-1−/− mice had a lower level of u-PA message than WT mice, the u-PA activity in PAI-1−/− mice should be higher than that in WT mice as described above. PAI-1 works not only as a serine protease inhibitor to prevent the ECM degradation, but acts as a de-adhesion molecule to detach cells attached to vitronectin via integrins (43). In addition, the de-adhesive activity of PAI-1 does not require its interaction with vitronectin. However, there is an absolute requirement for its binding to uPA. Free u-PA or PAI-1 with vitronectin has only weak detachment activity (44). The loss of detachment activity in PAI-1−/− mice might explain the inhibition of cell movement, including eosinophil infiltration. This detachment profile may change the signal transduction of leukocytes through cell-to-cell and cell-to-ligand interactions. Many reports suggest that malignant cells expressing more PAI-1 can metastasize more efficiently than tumors with less PAI-1 production (1). In addition, there are clinical reports that higher level of active PAI-1 in plasma due to the 4G/5G polymorphism of the PAI-1 gene is related closely to allergic disease (45, 46, 47). These reports, in conjunction with our study, support that PAI-1 is a rather critical regulator of some immune response for Ag stimulation. Observing the similar PAI-1-dependent deposition of collagen in the lung, Oh et al. (15) reported no significant difference in the numbers of peribronchial eosinophils and goblet cells and OVA-specific IgE levels after OVA challenge. There are differences in the target organ (the lung in the study by Oh et al. (15) and the nose in our study), in frequency of immunization with OVA (two to four times for 3 wk), in challenge frequency (three to five times a week for 4 wk), and in the area of lavage fluid collection (lung and nose). We do not know the exact reason for the discrepancy between their observation and ours. However, there may be differences in receptor and ligand distribution between the upper and lower airways and in the specificity of lavage fluid collection (48), because the numbers of eosinophils and goblet cells as well as OVA-specific IgE were more greatly increased in the OVA-challenged PAI-1−/− mice than in the saline-challenged control, although the levels were significantly lower than those in OVA-challenged WT mice in our system. In summary, we show that allergic rhinitis is restrained in OVA sensitization of PAI-1-deficient mice, and the immune response characteristics tend to shift from a Th2-dominant reaction to a Th1-dominant reaction. These findings, with other previous works, demonstrate that fibrinolytic components including PAI-1 play an important role not only in thrombolysis and proteolysis, but also in the immune response by changing the balance between the Th2 reaction and the Th1 reaction. We are grateful to Dr. Stephanie M. Jung for critical reading of the manuscript. ↵1 This work was supported in part by Grant-in-Aid for Scientific Research No. 15591021 (to S.M.) from the Japanese Ministry of Education, Culture, Sports, Science, and Technology, and by a Health and Labor Sciences Research grant (to Y.S.) from the Japanese Ministry of Health, Labor, and Welfare. ↵3 Abbreviations used in this paper: PA, plasminogen activator; t-PA, tissue-type PA; u-PA, urokinase-type PA; PAI, PA inhibitor; ECM, extracellular matrix; MMP, matrix metalloproteinase; WT, wild type; i.n., intranasal; NLF, nasal lavage fluid; PAS, periodic acid-Schiff; SI, stimulation index. Dano, K., P. A. Andreasen, J. Grondahl-Hansen, P. Kristensen, L. S. Nielsen, L. Skriver. 1985. Plasminogen activators, tissue degradation and cancer. Adv. Cancer Res. 44: 139-266. Loskutoff, D. J., M. Sawdey, J. Mimuro. 1989. Type 1 plasminogen activator inhibitor. Prog. Hemost. Thromb. 9: 87-115. Carmeliet, P., D. Collen. 1995. Gene targeting and gene transfer studies of the plasminogen/plasmin system: implications in thrombosis, hemostasis, neointima formation, and atherosclerosis. FASEB J. 9: 934-938. Saksela, O., D. B. Rifkin. 1998. Cell-associated plasminogen activation: regulation and physiological functions. Annu. Rev. Cell Biol. 4: 93-126. Kawano, T., K. Morimoto, Y. Uemura. 1968. Urokinase inhibitor in human placenta. Nature 217: 253-254. Holgate, S. T.. 1998. Airway remodeling. Eur. Respir. Rev. 8: 1007-1011. Bousquet, J., P. K. Jeffery, W. B. Busse, M. Johnson, A. M. Vignola. 2000. Asthma: from bronchoconstriction to airway remodeling. Am. J. Respir. Crit. Care Med. 61: 1720-1745. Collen, D.. 1999. The plasminogen (fibrinolytic) system. Thromb. Haemost. 82: 259-270. Yamashiro, Y., M. Nakamura, G. W. Huang, T. Kosugi. 1992. Presence of urokinase type plasminogen activator (u-PA) in tissue extracts of antrochoanal polyp. Laryngoscope 102: 1049-1052. Hamaguchi, Y., M. Ohi, Y. Sakakura, Y. Miyoshi. 1985. Purification and characterization of tissue-type plasminogen activator in maxillary mucosa with chronic inflammation. Thromb. Haemost. 54: 485-489. Yasuda, T., Y. Sakata, S. Madoiwa, J. Mimuro, M. Matsuda, K. Kitamura. 1998. Fibrinolytic components in nasal mucosa and nasal secretion. Histochem. Cell Biol. 110: 449-455. Sejima, T., S. Madoiwa, J. Mimuro, T. Sugo, T. Ishida, K. Ichimura, Y. Sakata. 2004. Expression profiles of fibrinolytic components in nasal mucosa. Histochem. Cell Biol. 122: 61-73. Cho, S. H., I. P. Hall, M. Wheatley, J. Dewar, D. Abraha, J. D. Mundo, H. Lee, C. K. Oh. 2001. Possible role of the 4G/5G polymorphism of the plasminogen activator inhibitor 1 gene in the development of asthma. J. Allergy Clin. Immunol. 108: 212-214. Bucková, D., L. Izakovicova Hollá, J. Vácha. 2002. Polymorphism 4G/5G in the plasminogen activator inhibitor-1 (PAI-1) gene is associated with IgE-mediated allergic diseases and asthma in the Czech population. Allergy 57: 446-448. Oh, C. K., B. Ariue, R. F. Alban, B. Shaw, S. H. Cho. 2002. PAI-1 promotes extracellular matrix deposition in the airways of a murine asthma model. Biochem. Biophys. Res. Commun. 294: 1155-1160. Carmeliet, P., L. Kieckens, L. Schoonjans, B. Ream, A. V. Nuffelen, G. Prendergast, M. Cole, R. Bronson, D. Collen, R. C. Mulligan. 1993. Plasminogen activator inhibitor-1 gene-deficient mice. I. Generation by homologous recombination and characterization. J. Clin. Invest. 92: 2746-2755. Carmeliet, P., J. M. Stassen, L. Schoonjans, B. Ream, J. J. van den Oord, M. De Mol, R. C. Mulligan, D. Collen. 1993. Plasminogen activator inhibitor-1 gene-deficient mice. II. Effect on hemostasis, thrombosis, and thrombolysis. J. Clin. Invest. 92: 2756-2760. Saito, H., K. Howie, J. Wattie, A. Denburg, R. Ellis, M. D. Inman, J. A. Denburg. 2001. Allergen-induced murine upper airway inflammation: local and systemic changes in murine experimental allergic rhinitis. Immunology 104: 226-234. Nettleton, G. S., A. M. Carpenter. 1997. Studies of the mechanism of the periodic acid-Schiff histochemical reaction for glycogen using infrared spectroscopy and model chemical compounds. Stain Technol. 52: 63-77. Jember, A. G., R. Zuberi, F. T. Liu, M. Croft. 2001. Development of allergic inflammation in a murine asthma model is dependent on the costimulatory receptor OX40. J. Exp. Med. 193: 387-392. Luna, L. C.. 1968. Manual of Histologic Staining Methods of the Armed Forces Institute of Pathology 3rd Ed. 111 McGraw-Hill, New York. .
Rieder, G., R. A. Hatz, A. P. Moran, A. Walz, M. Stolte, G. Enders. 1997. Role of adherence in interleukin-8 induction in Helicobacter pylori-associated gastritis. Infect. Immun. 65: 3622-3630. Nakayama, J., H. Tahara, E. Tahara, M. Saito, K. Ito, H. Nakamura, T. Nakanishi, E. Tahara, T. Ide, F. Ishikawa. 1998. Telomerase activation by hTRT in human normal fibroblasts and hepatocellular carcinomas. Nat. Genet. 18: 65-68. Bièche, I., I. Laurendeau, S. Tozlu, M. Olivi, D. Vidaud, R. Lidereau, M. Vidaud. 1999. Quantitation of MYC gene expression in sporadic breast tumors with a real-time reverse transcription-PCR assay. Cancer Res. 59: 2759-2765. Rickles, R. J., A. L. Darrow, S. Stricklad. 1988. Molecular cloning of complementary DNA to mouse tissue plasminogen activator mRNA and its expression during F9 teratocarcinoma cell differentiation. J. Biol. Chem. 263: 1563-1569. Belin, D., J. D. Vassalli, C. Combepine, F. Godeau, Y. Nagamine, E. Reich, H. P. Kocher, R. M. Duvoisin. 1985. Cloning, nucleotide sequencing and expression of cDNAs encoding mouse urokinase-type plasminogen activator. Eur. J. Biochem. 148: 225-232. Prendergast, G. C., L. E. Diamond, D. Dahl, M. D. Cole. 1990. The c-myc-regulated gene mr1 encodes plasminogen activator inhibitor 1. Mol. Cell. Biol. 10: 1265-1269. Sabath, D. E., H. E. Broome, M. B. Prystowsky. 1990. Glyceraldehyde-3-phosphate dehydrogenase mRNA is a major interleukin 2-induced transcript in a cloned T-helper lymphocyte. Gene 91: 185-191. Madoiwa, S., T. Yamauchi, Y. Hakamata, E. Kobayashi, M. Arai, T. Sugo, J. Mimuro, Y. Sakata. 2004. Induction of immune tolerance by neonatal intravenous injection of human factor VIII in murine hemophilia A. J. Thromb. Haemost. 2: 754-762. Sanai, A., H. Nagata, A. Konno. 1999. Extensive interstitial collagen deposition on the basement membrane zone in allergic nasal mucosa. Acta Otolaryngol. 119: 473-478. Boulet, L., M. Laviolette, H. Turcotte, A. Cartier, M. Dugas, J. Malo, M. Boutet. 1997. Bronchial subepithelial fibrosis correlates with airway responsiveness to methacholine. Chest 112: 45-52. Hattori, N., J. L. Degen, T. H. Sisson, H. Liu, B. B. Moore, R. G. Pandrangi, R. H. Simon, A. F. Drew. Bleomycin-induced pulmonary fibrosis in fibrinogen-null mice. J. Clin. Invest. 106: 1341-1350. Cho, S. H., S. W. Tam, S. Demissie-Sanders, S. A. Filler, C. K. Oh. 2000. Production of plasminogen activator inhibitor-1 by human mast cells and its possible role in asthma. J. Immunol. 165: 3154-3161. Mosmann, T. R., H. Cherwinski, M. W. Bond, M. A. Giedlin, R. L. Coffmann. 1986. Two types of murine helper T cell clone. I. Definition according to profiles of lymphokine activities and secreted proteins. J. Immunol. 136: 2348-2357. Sandler, N. G., M. M. Mentink-Kane, A. W. Cheever, T. A. Wynn. 2003. Global gene expression profiles during acute pathogen-induced pulmonary inflammation reveal divergent roles for Th1 and Th2 responses in tissue repair. J. Immunol. 171: 3655-3667. Del Prete, G., E. Maggi, P. Parronch, I. Chretien, A. Tiri, D. Macchia. 1988. IL-4 is an essential factor for the IgE synthesis induced in vitro by human T cell clones and their supernatants. J. Immunol. 140: 4193-4198. Ueda, A., N. Chandswang, Z. Ovary. 1990. The action of interleukin-4 on antigen-specific IgG1 and IgE production by interaction in vivo primed B cells and carrier-specific cloned Th2 cells. Cell. Immunol. 128: 31-40. Lopez, A. F., C. J. Sanderson, J. R. Gamble, H. D. Campbell, I. G. Young, M. A. Vadas. 1988. Recombinant human interleukin 5 is a selective activator of human eosinophil function. J. Exp. Med. 167: 219-224. Yamaguchi, Y., Y. Hayashi, Y. Sugama, Y. Miura, T. Kasahara, S. Kitamura, M. Torisu, S. Mita, A. Tominaga. 1988. Highly purified murine interleukin 5 (IL-5) stimulates eosinophil function and prolongs in vitro survival: IL-5 as an eosinophil chemotactic factor. J. Exp. Med. 167: 1737-1742. Gyetko, M. R., S. Sud, G. H. Chen, J. A. Fuller, S. W. Chensue, G. B. Toews. 2002. Urokinase-type plasminogen activator is required for the generation of a type 1 immune response to pulmonary Cryptococcus neoformans infection. J. Immunol. 168: 801-809. Gyetko, M. R., S. Sud, S. W. Chensue. 2004. Urokinase-deficient mice fail to generate a type 2 immune response following schistosomal antigen challenge. Infect. Immun. 72: 461-467. Deng, G., S. A. Curriden, G. Hu, R. P. Czekay, D. J. Loskutoff. 2001. Plasminogen activator inhibitor-1 regulates cell adhesion by binding to the somatomedin B domain of vitronectin. J. Cell. Physiol. 189: 23-33. Tarui, T., N. Andronicos, R. P. Czekay, A. P. Mazar, K. Bdeir, G. C. Parry, A. Kuo, D. J. Loskutoff, D. B. Cines, Y. Takada. 2003. Critical role of integrin α5β1 in urokinase (uPA)/urokinase receptor (uPAR, CD87) signaling. J. Biol. Chem. 278: 29863-29872. Dawson, S. J., B. Wiman, A. Hamsten, F. Green, S. Humphries, A. M. Henney. 1993. The two allele sequences of a common polymorphism in the promotor of the plasminogen activator inhibitor-1 (PAI-1) gene respond differently to interleukin-1 in HepG2 cells. J. Biol. Chem. 268: 10739-10745. Eriksson, P., B. Kallin, F. M. van’t Hooft, P. Bavenholm, A. Hamsten. 1995. Allele-specific increase in basal transcription of the plasminogen activator inhibitor 1 gene is associated with myocardial infarction. Proc. Natl. Acad. Sci. USA 92: 1851-1855. Hermans, P. W., M. L. Hibberd, R. Booy, O. Daramola, J. A. Hazelzet, R. de Groot. 1999. 4G/5G promoter polymorphism in the plasminogen activator ihibitor-1 gene and outcome of meningococcal disease: Meningococcal Research Group. Lancet 354: 556-560. Hellings, P. W., E. M. Hessel, J. J. van den Oord, A. Kasran, P. van Hecke, J. L. Ceuppens. Eosinophilic rhinitis accompanies the development of lower airway inflammation and hyper-reactivity in sensitized mice exposed to aerosolized allergen. Clin. Exp. Allergy 31: 782-790.